Welcome to my virtual field trip on Aztec music! It includes: 1) a brief description of Aztec instruments; 2) a guide to translating Aztec drum syllables into musical notation, 3) recreations of Aztec drum rhythms and music, and 4) multimedia activities that combine Aztec drumming with other areas of the curriculum! So, take a couple of minutes to read more about Aztec culture, learn how to vocalize some rhythms using Aztec drum syllables, and explore some surprisingly fun connections we can make between language, math, and music! 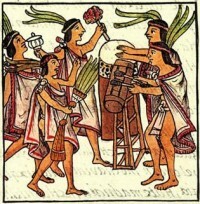 The Aztecs used a variety of wind and percussion instruments to make music. The most popular wind instruments included clay flutes, ocarinas, and conch shell trumpets. Aztec percussion instruments included rattles, rasps, shakers, and a variety of drums. The most important of these was the huehuetl (pronounced weh-weht), a large vertical hand drum covered with stretched animal hide. The huehuetl produced two tones — the lower by striking the center of the drum head, and the higher by playing near the outer rim. Its horizontal counterpart was the teponaztli (pronounced tay-po-nawtz-lee), a cylindrical wooden log drum that was played with mallets. By striking the mallets on the left and right tongues, two distinct tones were produced. The huehuetl and teponaztli were traditionally played together, and served an important role in accompanying Aztec songs. The rhythms on this page are derived from a 16-century document entitled Cantares Mexicanos.1 It is a collection of poems and songs written in Nahuatl (pronounced naw-wa-tul), the language spoken by Aztecs. Of particular interest are the drum patterns that accompany many of the songs in this collection. Each drum pattern is written using four syllables, i.e., To, Co, Ti, and Qui, which for our younger readers we will standardize here as To, Ko, Ti, and Ki. Listen to Phil explain how this works by pressing the Play button below — it might take awhile to load depending on your connection. In order to translate these syllables into musical notation, we will follow two simple rules: the first rule applies to pitch, the second rule to rhythm. Rule #1: To and Ko will be low tones. Ti and Ki will be high tones. When To and Ko are spoken, the huehuetl and teponaztli play a low tone — when Ti and Ki are spoken, they play a high tone. The other non-pitched instruments like the shakers simply play the rhythms. Rule #2: To and Ti will be downbeats. Ko and Ki will be upbeats. 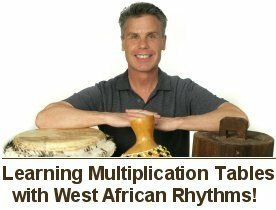 By applying these two rules, we can recreate the way Aztec drumming patterns may have sounded — and the resulting rhythms can be written with just three musical symbols: quarter note, quarter rest, and eighth notes. For more information on connecting musical notes and fractions, please see Phil's multimedia activity on Fraction Pies! After a short rumble, you will hear them speak the drum syllables as they play their percussion instruments. Then you will hear a melody being played on a clay ocarina — since no surviving Aztec melodies can be found, we will use indigenous melodies from Mexico. In each case, the melodies being played will be adapted to perfectly fit our Aztec drum rhythms. The first Aztec rhythm is from Song 48 in the collection, and is entitled Song of Tlaltecatzin of Cuauhchinanco. The adapted melody is a Huichol Deer Hunting Song 2 from the northwest portion of Jalisco. To hear the example, simply press the play button. The third Cantares rhythm is from Song 57C and is dedicated to the Aztec ruler Ahuitzotl. The adapted melody is a Cora Mitote (Maize Ceremony) Song1 from Nayarit. Incidentally, the Coras still use Aztec syllables when singing this song! Participate in an Aztec percussion group and play rhythms using syllables and fractions. Hear more Aztec drum rhythms — they're integrated into Phil's free multimedia activities. 1. Cantares Mexicanos: Songs of the Aztecs Translated by John Bierhorst. Stanford University Press; 1985. 2. Music in Aztec and Inca Territory by Robert Stevenson. Berkeley and Los Angeles: University of California Press, 1968. Second edition, 1976.